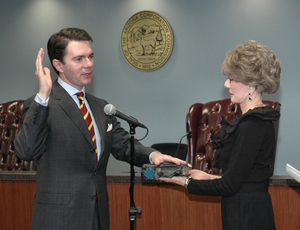 ← What is in Commissioner Stump’s text messages? Today, we publish the entire, 240-page log of Arizona Corporation Commissioner Bob Stump’s text messages in a searchable format. We are also looking for the public’s help in identifying senders or receivers of text messages who we could not identify. 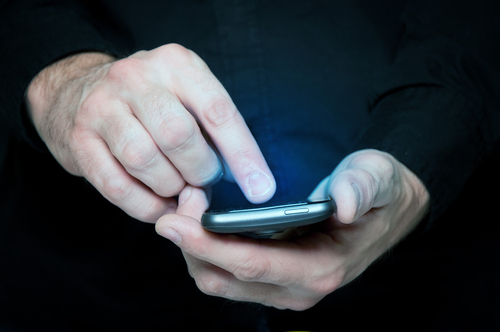 Further analysis of the text message logs of Arizona Corporation Commission’s Bob Stump provides new insights into the pattern of contacts by the former chairman. Click here to access and updated list of all the names we’ve tentatively identified to date and their number of texts. Click here to find the entire searchable log. We converted the text message log, provided by the Commission in response to our March 11 records request, into an Excel Spreadsheet. We then searched open source records including Google, LexisNexis, and Spokeo to determine the owners of phone numbers with whom Stump exchanged text messages. New analysis has yielded some striking insights that we list below. We could not identify many numbers. If you recognize any we have not identified, please send us your findings to: capturedregulator@checksandbalancesproject.org. We protect the identity of sources. In the months leading up to Arizona’s primary election on August 26, 2014, in which two sets of Republican candidates were pitted against each other – one pro-rooftop solar, the other pro-utility – our initial investigation showed indications that Stump was in extensive contact with many players in the dark money election scheme that helped elect the pro-Arizona Public Service candidates. The pattern of those text messages suggest Stump not only knew, but also raises the question of whether he could have been coordinating the election of winning GOP candidates (now commissioners) Doug Little and Tom Foresee with APS’ Barbara Lockwood, and Scot Mussi, the head of the dark money electoral group, Arizona Free Enterprise Club. Arizona Public Service (APS) is widely believed to have funded much of the dark money election scheme. A new examination of the text logs shows that then-Chairman Stump first reached out to Sean Noble, executive director and president of American Encore, a 501(c) 4 nonprofit reported to be a conduit for the Koch Brothers donor network, on July 17. They corresponded regularly through 18 texts in the next eight days then stopped. This period was five weeks before Arizona’s primary to select Republican candidates for the Commission. 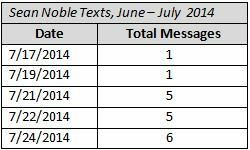 At no other time from May 1, 2014, through March 11, 2015, did Stump and Noble text each other, according to the log. The text messages with Noble overlap the time period during which Chairman Stump was texting with Scot Mussi, president and sole board member, of the Arizona Free Enterprise Club. Checks and Balances Project had previously reported that Mussi and Stump exchanged 46 texts. Our recount shows the prior number was conservative. The actual number is higher: 73. Four days before Stump first texted Sean Noble, he reached out to APS’s general manager of regulatory affairs and compliance Barbara Lockwood on July 13, 2014. 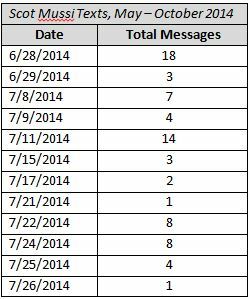 Over the next 15 days, until July 31, the Chairman and Lockwood would swap 44 texts, then stop for nearly two months. Something seems to have happened during the final two weeks of July. Stump was texting Noble, whom he stopped on July 24; Mussi, whose last text was on July 26; and candidate, now Commissioner Tom Forese, with whom he stopped texting on July 26. 1,806 texts exchanged with Lon Huber, consultant to AZ Residential Utility Consumer Office (RUCO). The mission of RUCO is to serve Arizona’s Residential Utility. Essentially, it is supposed to be the advocate for Arizona consumers, who, it should be noted, overwhelmingly want access to low-cost rooftop solar. One of the most frequent text contacts for Stump on his taxpayer-reimbursed phone was a key RUCO consultant, Lon Huber. The logs show that Stump and Huber exchanged 1,806 text messages – an average of over five a day over the 11 month period the records cover. Huber debated solar industry attorney Court Rich at Solar Summit 2014, arguing for the benefits of government-supported monopoly untilities competing in the low-cost rooftop solar market against private enterprise. 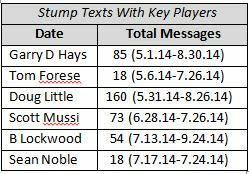 The full text logs and the analysis provided here provide a thicker cast of Stump’s text contacts. They also show an even less flattering set of facts than the contacts reported to date for an elected body supposed to be neutrally overseeing large parts of the Arizona economy on behalf of its citizens. When Stump’s text messages are finally released and if suspicions of electioneering turn out to be correct, it’s not just Bob Stump who could potentially be at fault. It’s also commissioners Tom Forese and Doug Little – perhaps others on the Commission and staff, as well. This is very likely why this same set of players at the ACC now asserts that it should control the discovery and release of the text messages that it very clearly doesn’t want the public to see. The fact remains that the Commission already has the subpoena power to order Verizon to release the text message content immediately. The messages are, literally, a phone call away. The Arizona Corporation Commission’s gamesmanship from last week continues to suggest a deep-seated fear of public access to public records.